Are you concerned with space, functionality, flexibility, reliability or cost? Probably, your answer is “all of the above.” These were SeaView’s concerns that drove us to develop a fiber optic multiplexer that would perform all the tasks our customers needed, all in a single card. 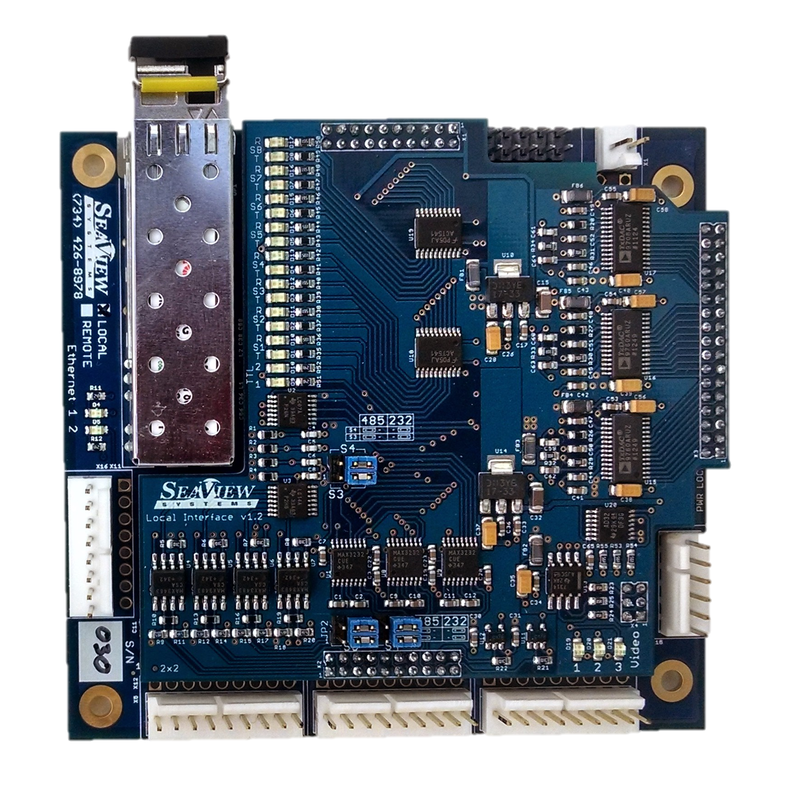 Our card supports three channels of standard video, 100mb Ethernet, and eight serial channels in various combinations and two high speed trigger pulses. This device is simple to integrate. It has baud-rate tolerant circuitry eliminating the need to set up confusing DIP switches. By setting simple jumpers, two serial channels will internally convert between RS-485 on bottom to RS-232 on the surface (or vice versa) eliminating the need for inline converters on the surface; a perennial source of trouble. Want to run HD-SDI or Gigabit Ethernet as well as standard video and serial data? No problem. We have the flexibility to configure our boards to work in with external off-the-shelf transceivers performing these specialized tasks. 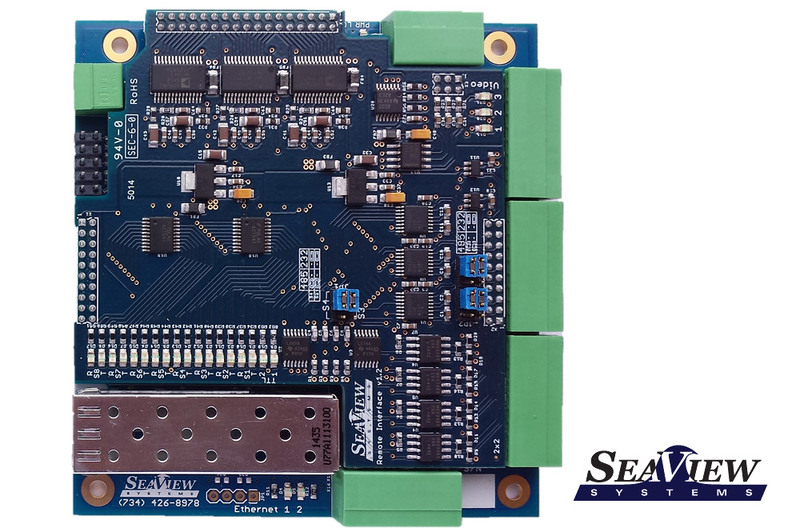 Let SeaView set you up with a comprehensive system supporting all you need to run, all in one compact package, running on one single mode fiber. Our cards use all surface mount technology. Each unit is thoroughly tested in an extreme environmental and vibration test enclosure. 2 x RS485: Max baud rate 230,400 bps. 4 x RS232: Max baud rate 230,400 bps. 2 x either RS232 or RS485. Onboard RS485-RS232 conversion. All serial channels are transparent to baud rate. No DIP switch settings required. Power, Fiber lock, 2 x Ethernet (one for each port). RX/TX for each of 8 serial ports, video signal indicators. Single Mode (Multimode optional) LC Connector via SFP Module 1490/1550 nm BiDi. CWDM frequencies also available. Phoenix Contact Advantage – Easily connect and disconnect conductors. Disadvantage – larger footprint. Molex: Advantage- Smaller footprint. Disadvantage- Conductors need to be crimped to the Molex connector that plugs into the header. The SVS-109L(x) is a local or surface card that receives video. The SVS-109R(x) is the remote card that transmits video. The SVS-109(x)P uses the Phoenix Contact COMBICON FK-MC series terminal blocks for quick wire termination. The SVS-109(x)M uses the more compact Molex KK® 6471 series headers. Wires need to be crimped to the Molex connectors (supplied).